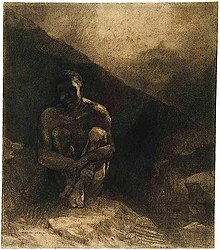 Primitive Man (Seated in Shadow) Odilon Redon, 1872. The Art Institute of Chicago. Primitive Culture is an 1871 book by Edward Burnett Tylor. According to Tylor a defining characteristic of primitive cultures is a greater amount of leisure time than in more complex societies. In 1953, John Carothers, a colonial psychiatrist who had previously worked at Mathari Mental Hospital in Nairobi, Kenya, published a report for the World Health Organization claiming and quoting several authors that compared African psychology to that of children, to immaturity compared the African mind to a European brain that had undergone a lobotomy. They were caricatures of primitive people at peace with nature, dwelling in a fascinating world of hallucinations and witch doctors. However, African researchers have dismissed this concept, Thomas Adeoye Lambo, a leading psychiatrist and member of the Yoruba people wrote about the subject that they were "glorified pseudo-scientific novels or anecdotes with a subtle racial bias, having so many gaps and inconsistencies, that they can no longer be seriously presented as valuable observations of scientific merit". Even so, views like Carothers's had been echoed over decades of colonialism, becoming so commonplace that they were considered to be somewhat of a truism. Further research published in JAMA has found very high rates of clinical depression in impoverished nations, such as Zimbabwe, and that depression wasn't a Western disease but a human one, and in fact glossing over primitive culture as being leisure filled and stress-free was entirely opposite of scientific findings. Cultural primitivism has also been applied to interpretations of unfamiliar cuisines. The eating practices of Native American cultures have been likened to the ways of the noble savage, whose eating practices are characterized as equitable and inclusive. These qualifications are made from an etic perspective. Barbecue in particular has been studied by the scholar Andrew Warnes. ^ Farb, Peter (1968). Man's Rise to Civilization As Shown by the Indians of North America from Primeval Times to the Coming of the Industrial State. New York City: E. P. Dutton. p. 28. LCC E77.F36. Despite the theories traditionally taught in high-school social studies, the truth is: the more primitive the society, the more leisured its way of life. ^ Warnes, Andrew (2008-01-01). Savage Barbecue: Race, Culture, and the Invention of America's First Food. University of Georgia Press. ISBN 9780820328966. Joseph Campbell, The Historical Atlas of World Mythology, vols. I and II, Harper and Row 1988, 1989.